Batangas Governor’s Advocate Mr. Ronel del Rio, the only Filipino chosen by the United Nations-Economic and Social Commission in the Asia Pacific (UN-ESCAP), joins six others from other AP countries, as official ‘PROMOTERS’’ of the “3rd Decade of Persons with Disabilities”, 2013-2023. 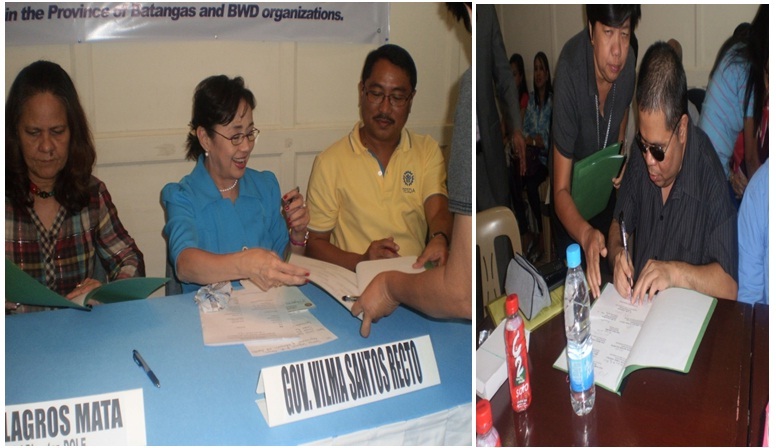 Ronel with many hats, takes his role as Governor Vilma Santos-Recto’s Advocate’s most seriously, inspired by the former’s full support, shown here signing manifesto of commitment to engage the business sector in creating work ops for Batanguenos with disabilities. Batangas LGU’s powerhouse cast led by Ronel…whose award as UN-ESCAP’s Promoter in AP was proudly announced by NCDA Acting Executive Director Carmen, at the SubCom on Access to Justice launch. Mr. del Rio, a longtime radio announcer and focal person on the Philippine Disability Affairs Office (PDAO)-Batangas Province, is an active member of the Philippine Coalition on the UN-CRPD and also a prominent feature of the Fully Abled Nation (F.A.N. ), a campaign for disability-inclusive elections. 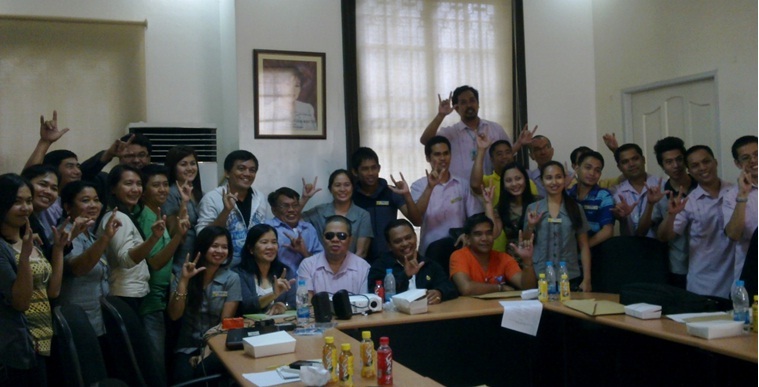 Shown below as host/coordinator of the “Web Access Workshop”, he recruited 27 interoffice personnel in the Batangas Provincial Capitol, to learn to make their website “PWD-friendly” , as an empowering tool for Batangueños with disabilities. The workshop was held in sync with the National Council on Disability Affairs (NCDA) and the Philippine Web Accessibility Group (PWAG)whose President , Mr. Jojo Esposa, served as the main Resource Person. As promoter, Mr. del Rio is tasked to launch a dynamic campaign, alongside other promoters, to ‘MAKE THE RIGHT REAL” for persons with disabilities, called for in the ‘UN- Convention on the Rights of Persons with Disabilities’.